A couple of weeks ago I ran across some $50 stripped AR 15 lower receivers. Since I already had one that was set up similar to an SPR, I thought it would be nice to do a low cost AR 15 build with this one. The lower is from Anderson Rifles and I went shopping online for some good parts deals to complete my build. As a disclaimer, I did have a few parts already. This meant that I did not have to buy a buffer tube, buffer, spring or stock. I also had an old milspec trigger group and handle. Total this saved me about $60-$70, so keep that in mind as I go through this build. First thing I went looking for was a lower parts kit. This landed me on Red Barn Armory’s website. What I liked about their site was that I had the option to build the parts kit and upgrade or leave out parts as needed. Because of the parts I already had, I got the rest of the lower kit and even upgraded my pins as well as added a Magpul sling attachment point for $27. Total price to complete my lower was $135 with shipping. I then went looking for some upper parts. Since I was more interested in cost than I was anything else, I investigated some complete upper builds. The best deals I found were on the Daytona Tactical site. I found a complete upper (no BCG or charging handle) deal for $235. With shipping it was around $255. This was an important upgrade for me so that I had a free floating handguard build to increase accuracy. The full length of the handguard also left the rifle with a great look that reminds me of the Star Wars T-21 rifle. For those keeping track, I have now acquired all the parts needed for an AR 15 except a BCG, charging handle, and some sights. This brought me to Amazon for some good deals. The BCG I got was $100 and seems to be of decent quality and seems to function properly. I did splurge a bit on the charging handle. I got a BCM Gunfighter charging handle. The cost of both of these items was about $145. Last thing I got was a Vortex Strikefire 2 red/green dot optic. Because I get special pricing through several of my group affiliations I only paid $140 for mine. If you get this one through Amazon, it will cost you right at $179 if you have Prime. The top rifle is the finished build. The bottom one is my wife’s with all sorts of addons and goodies. For anyone building this from scratch it would be an additional $100 for this optic and the other lower receiver parts that I had. The costs of this build is actually cheaper than you can get an M&P Sport AR rifle. The Sport doesn’t have a forward assist and has an A2 front sight post. It does come with a flip up rear sight, but the MSRP is $739.00. Again, building the AR like I propose is much less costly and already gives you several upgrades from the onset. Good luck if you decide to do your own build. It is quite fun and fulfilling to know that you literally built your own rifle from parts! 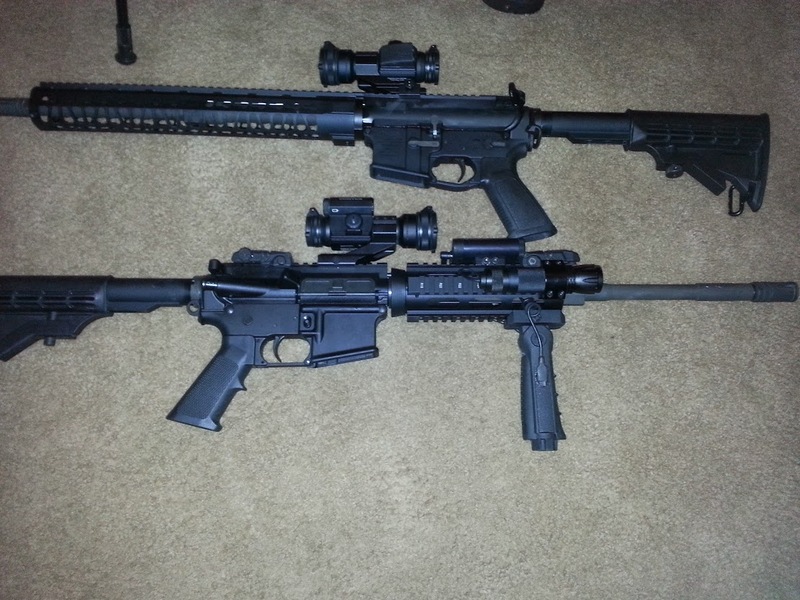 This entry was posted in DIY Projects, Firearms and tagged AR 15, AR15, cheap AR, cheap ar 15, cheap ar build, cheap AR15, inexpensive ar build on April 15, 2015 by Woodsbum.